Theresa May’s hopes of getting a Brexit deal through Parliament have been handed a devastating blow today after the DUP signalled that it does not intend to back it. The Northern Irish party’s Brexit spokesman said there was ‘no pressure on me or my party to vote for this deal’ as the Prime Minister headed to Brussels. EU leaders are expected to make a three-month Brexit delay sought by Mrs May today conditional on her being able to squeeze a withdrawal agreement through the Commons next week. But hardline unionist and Brexiteer Mr Wilson tore into Brussels, including European Council president Donald Tusk, accusing them of ‘arrogance’ over their offer in an interview with TalkRadio. He said: If anything the arrogance of the EU negotiators … this arrogance is born of the fact that the EU see us as a bit of a rollover when it comes to negotiations. 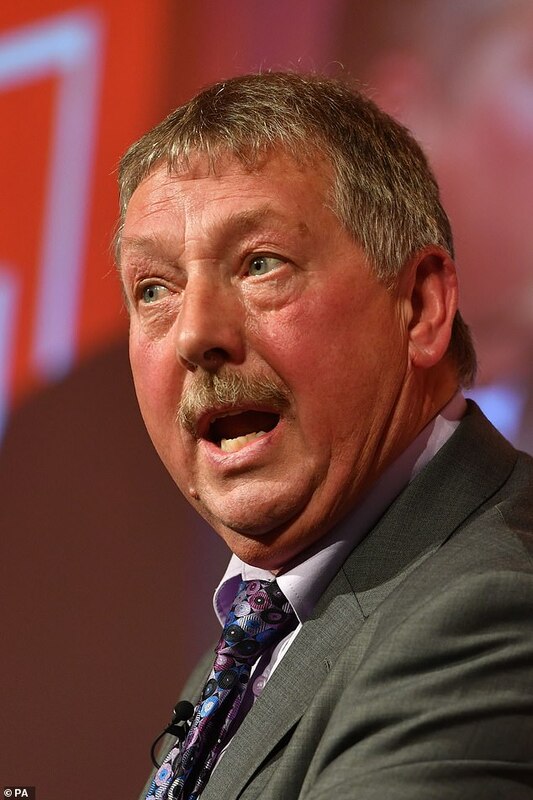 The DUP has a ‘confidence and supply’ deal with Mrs May’s Conservatives for its 10 MPs to support her in the Commons. But they have so far voted against her Brexit deal twice because of their intense opposition to the provisions for the Northern Irish border backstop. Even with their support Mrs may faces an uphill task to convince MPs to back her. The last time she put a meaningful vote to the Commons on March 12 she lost by 149 votes, including 75 Tory rebels. 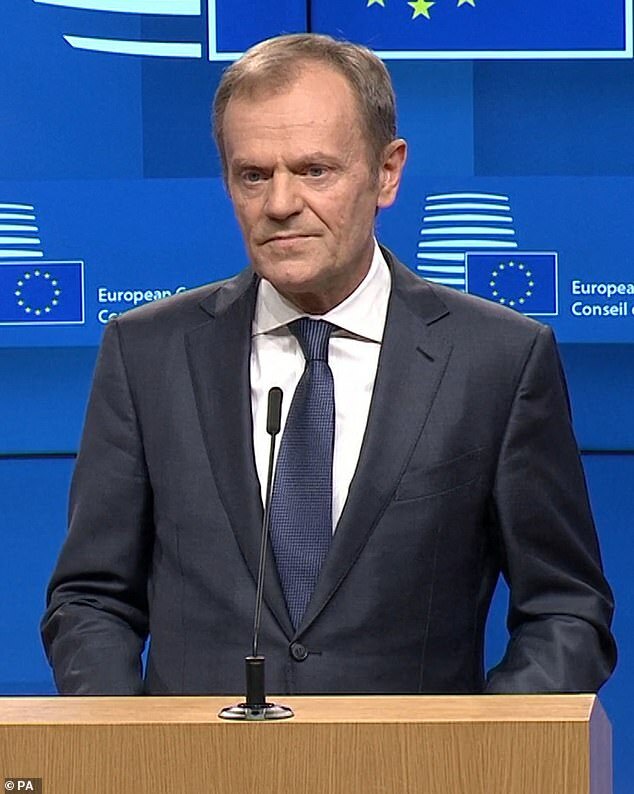 Yesterday Mr Tusk said: ‘In the light of the consultations that I have conducted over the past days, I believe that a short extension would be possible. Foreign Secretary Jeremy Hunt today admitted the Prime Minister is ‘under extraordinary pressure’ after raging MPs branded her a ‘f***ing disgrace’ for using a TV speech to scold them for not backing her Brexit deal. With the UK just eight days from a No Deal departure, Mrs May went on live TV to condemn the Commons for failing to back her EU withdrawal agreement and accused them of playing ‘political games’. 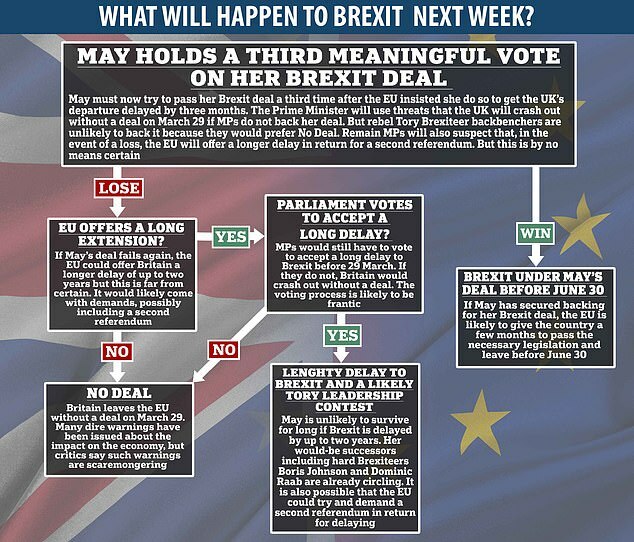 The Downing Street address was meant to persuade Brexiteer Tories, Labour rebels and the DUP to back her deal – after the EU said it would only grant a short delay to Article 50 if the Prime Minister can win a vote on her plan before next Friday. But May’s address appears to have spectacularly backfired as she heads to Brussels today for a crucial summit. 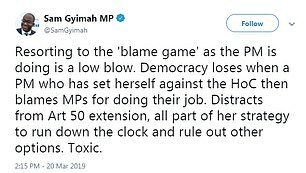 Her defiant speech caused a great deal of upset among MPs who branded it ‘toxic’, ‘contemptuous’, ‘incendiary and irresponsible’ while another called it a ‘f***ing disgrace’. Mr Hunt said ‘no Prime Minister in living memory has been tested’ in the way that Mrs May has and claimed the tone of her speech reflected her ‘extreme frustration’ at the current Brexit stalemate, which he said is ‘sapping our national confidence’. Defending the Prime Minister, who is facing calls to quit, he told the BBC: ‘Let’s not forget the extraordinary pressure she is under. She was expressing her frustration and the public’s frustration’ – but added: ‘I don’t think we should all make this about Theresa May’. Tellingly the Foreign Secretary twice admitted it is not yet certain Mrs May can bring back her deal for a third vote – but said if it’s defeated there are three options: No Deal, revoke Article 50 or a ‘long delay’ to Brexit. 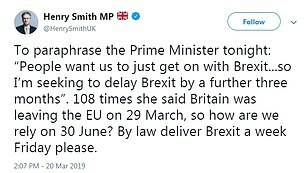 The Prime Minister will travel to Brussels today to ask for an extension until the end of June to try to get her plan through arriving at around midday. She will address EU leaders at around 3pm. Last night Mrs May appeared to misjudge a live TV speech by blast MPs for not backing her Brexit deal as she heads to Brussels today to beg for a three-month Article 50 extension. Tory Remainer Sam Gyimah hit out at his party leader and said: ‘Resorting to the blame game, as the PM is doing, is a low blow. Democracy loses when a Prime Minister who has set herself against the House of Commons then blames MPs for doing their job. It’s Toxic. ‘She knows MPs are receiving hate mail. We’re repeatedly being urged to hold their noses to the stench of this deal and vote for it. That cannot be the blueprint for our great country and I cannot support it’. Potential ‘switcher’ Lisa Nandy claimed last night that Mrs May had blown her chance and said: ‘There’s absolutely no chance she is going to win over MPs in sufficient numbers after that statement. It was an attack on liberal democracy itself. I will not support a government that takes such a reckless approach’. But Brexit Minister Kwasi Kwarteng said today he believes more MPs will back the Prime Minister’s deal after her intervention and insisted she has a ‘good shot at landing the deal and winning a vote next week’. He added: ‘I don’t think there is a blame game at all- she set out very clearly where we are in the process. There is a deal. If we get the deal through, we can get a short extension to the Article 50 process and we can leave the EU. ‘I think saying: ‘I’m with you’ makes perfect sense. The cab driver who drove me here this morning said: ‘I just want to leave…get the deal done and I want to be out of the EU’. ‘The Prime Minister very much reflected that opinion, which is widely held. People are fed up…they want to leave the EU’.